In the uplands of Northern Laos extension approaches are particularly challenged by extension staff needing to work with farmers of many different ethnicities. Often the staff and the farmers speak different languages and have markedly different education, cultural backgrounds and spiritual beliefs. We have found that a 'one size fits all' approach brings poor results when working cross-culturally. Methods need to be tailored for each ethnic group and extension staff need to understand and respect the cultures of the different groups they work with. 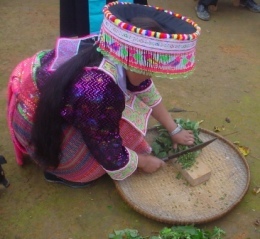 Using literature from a variety of cultural studies, we developed and tested operational guidelines for staff working with Akha, Hmong and Khamu people. These guidelines indicate to staff the polite and acceptable ways to engage with the different groups. They show how the cultural aspects of each group may affect their interest in proposed changes, and their traditional approach to engaging in change.